Before we get too far along on our Florida adventures, we wanted to acknowledge the effort so many of our friends and family made in being with us during Diana’s mother’s funeral. Many of you came to Ortonville from great distances, many sent cards and flowers, and a lot of you sent condolences through this blog and Facebook. One really nice thing occoured after we were back in Grand Rapids, preparing to get south for the winter. 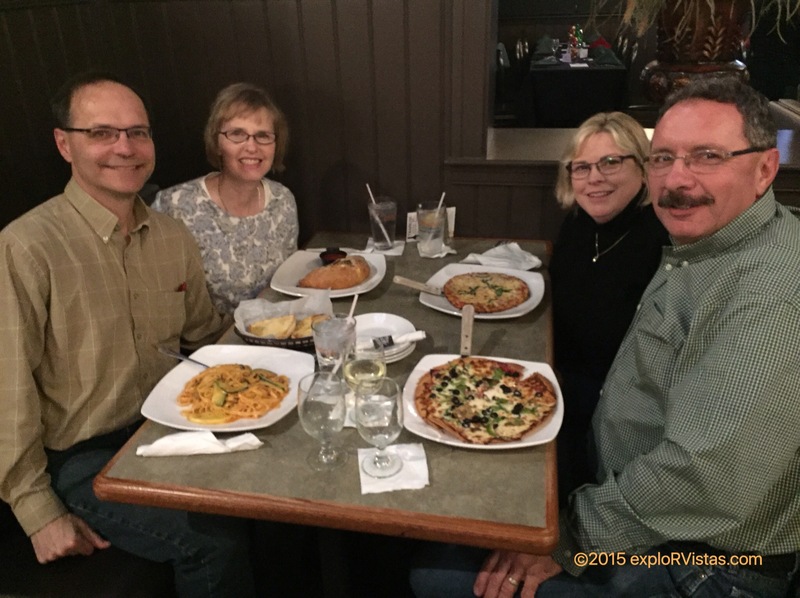 Our friends from college, Paul and Sheryl, called us up and wanted to take us to dinner before we left. We met halfway between Grand Rapids and Kalamazoo and had a nice evening. It was very sweet of them to do that. :). Thanks again to everyone; you all are treasures in our lives! We had a good time at the happy hour catching up on what everyone is doing. Monday morning, Diana was finishing up the thank you notes from the funeral, so I tagged along with Rod and Mary on a 10 mile bike ride to the top of the Melbourne Causeway and back. They wanted to show me the way to get through the neighborhoods to avoid traffic, as there isn’t a bike path the entire way in that direction. If you want to get your heart pumping, try riding a bike up one of those causeway bridges! :). Of special interest is the sports complex we passed by. Former NFL quarterback Doug Flutie is from Melbourne Beach, and the complex is named after him. 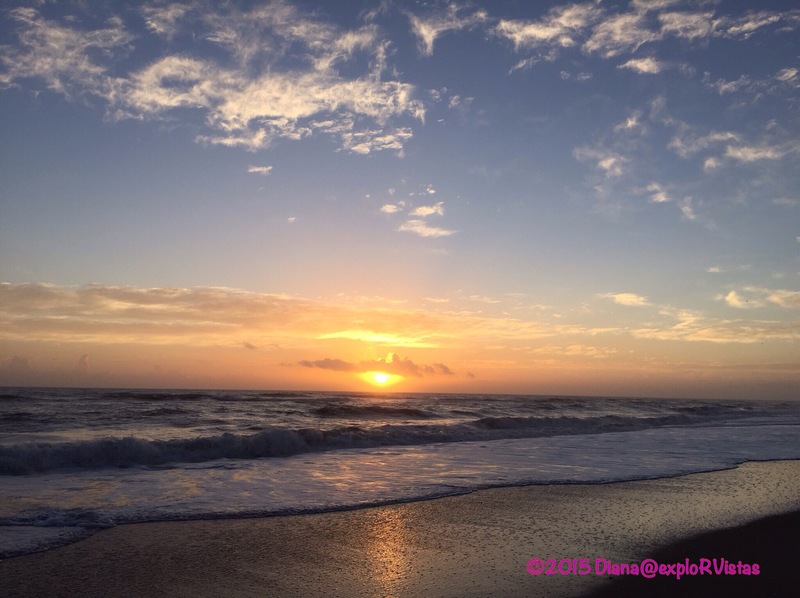 On Tuesday, Diana and I went for a sunrise walk down the beach. We really are enjoying being able to go for these morning strolls. 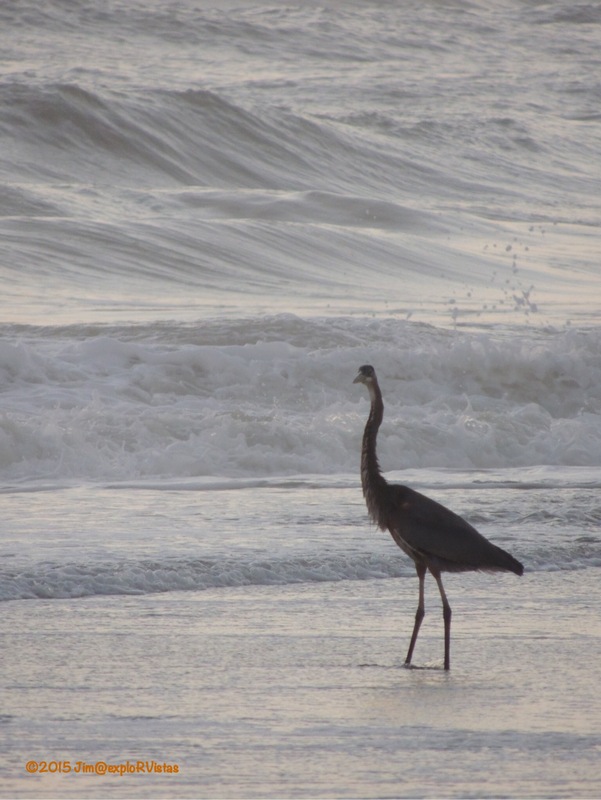 The Great Blue Herons were out for their morning walks also. They sure are beautiful to look at. We’ve noticed that they aren’t afraid of beach strollers. They also like to hang around the surf fishermen, as they sometimes get a free meal from them. 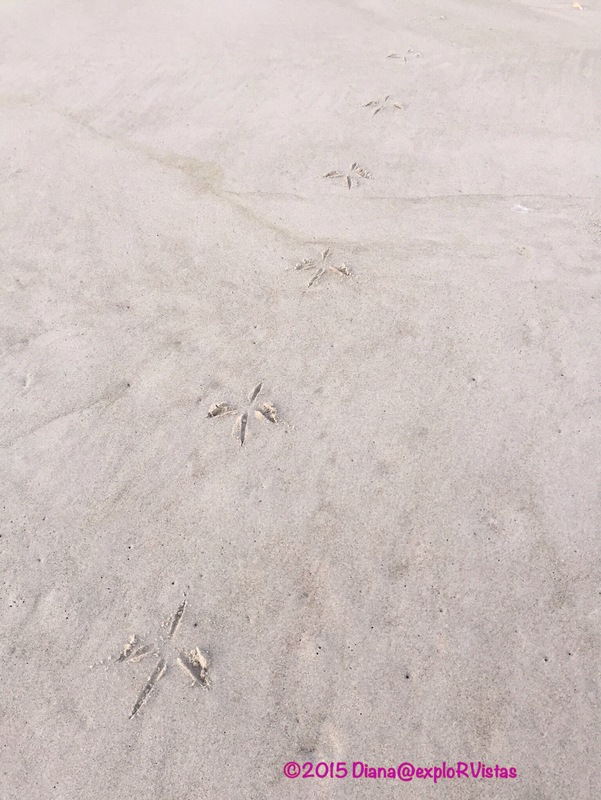 For such a large bird, they leave a delicate footprint. 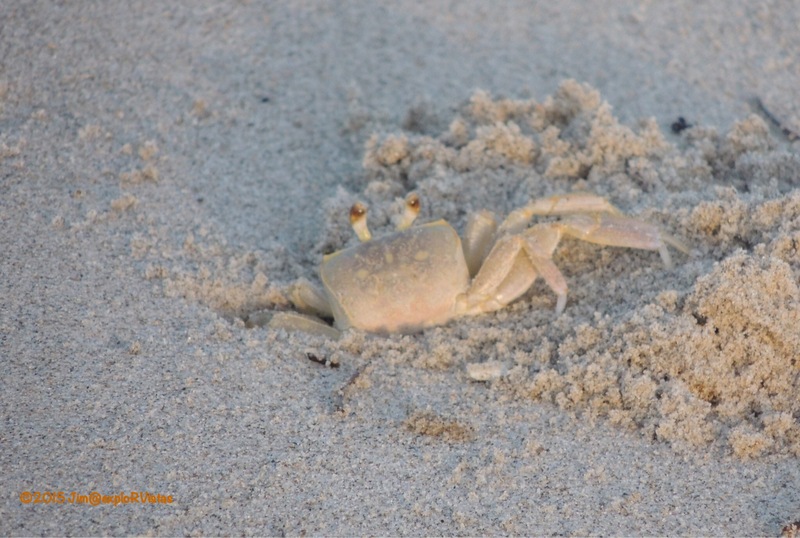 The crabs were busy popping in and out of the holes they had burrowed in the sand. We then went for a bike ride down A1A and stopped into Outdoor Resorts on the way back. The property is one of a chain of resorts in Florida and Virginia. People purchase their lots and sometimes rent them out, if they aren’t there. Nice place with three seperate pools. We toured up and down the streets on our trikes, scouting for future reference. 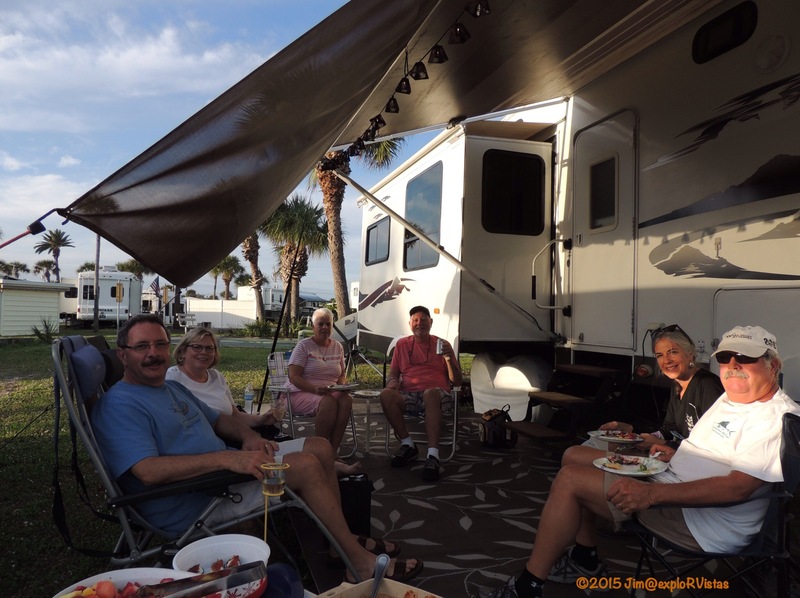 One thing is for certain: with properties such as this one and the one we are staying at spanning from the ocean to the intercoastal, it’s possible to put on some decent mileage without leaving the resort! After that, we decided to drive down to Vero Beach and see what was there. On the way back Diana spotted the Disney Vero Beach Resort, so we pulled in and asked the gate guard if the restaurant was open to the public. It was, so we decided to have lunch and look around. 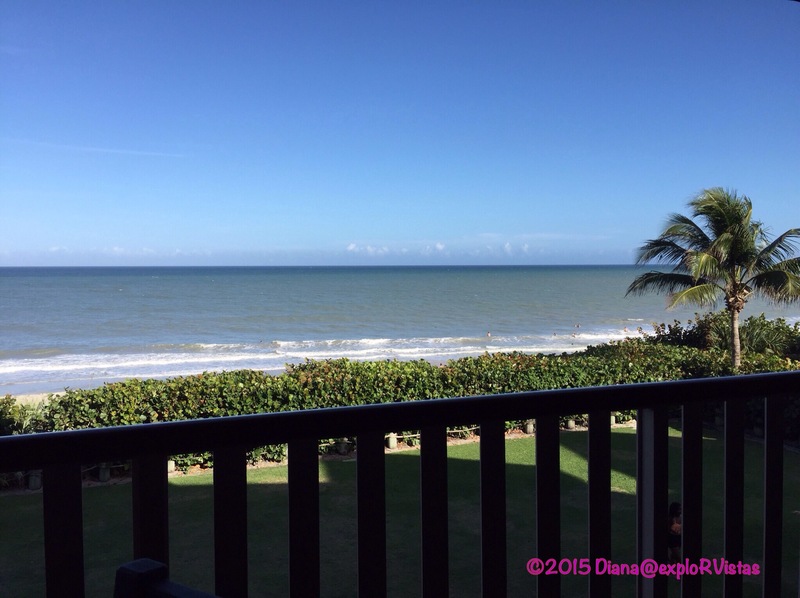 We ate at the bar on the second floor, and our table was on the deck overlooking the Atlantic. Pretty nice! I have to give a shout out to Disney on this: if you have a food allergy (which I do) and you alert the server to it, the chef makes a personal visit to your table to discuss what they can do for you. First class treatment, without a doubt. This happens at every Disney food establishment throughout the company. After lunch, we strolled the grounds to check out what was there. Diana is standing in front of their main building, and the deck where we had just eaten lunch. 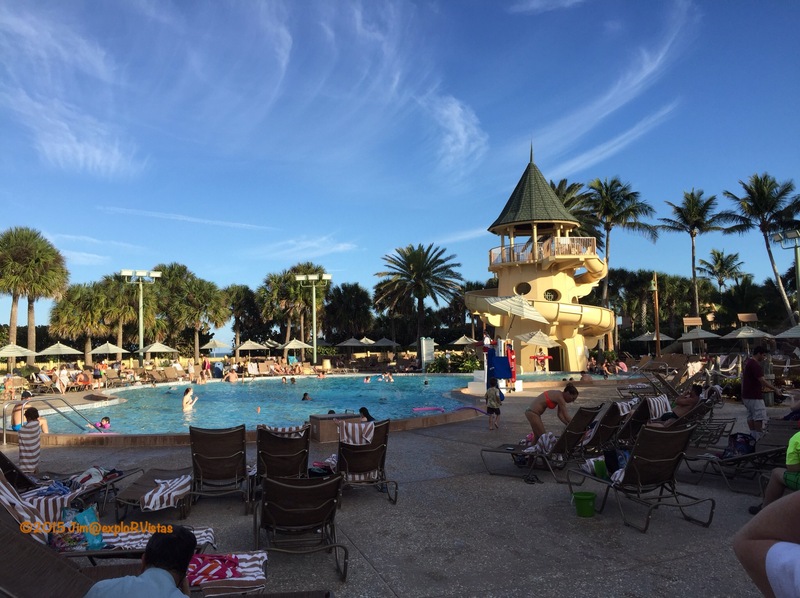 The pool area was very crowded, as there weren’t the usual theme parks to draw the families away from the resort. They sure were having fun, though! 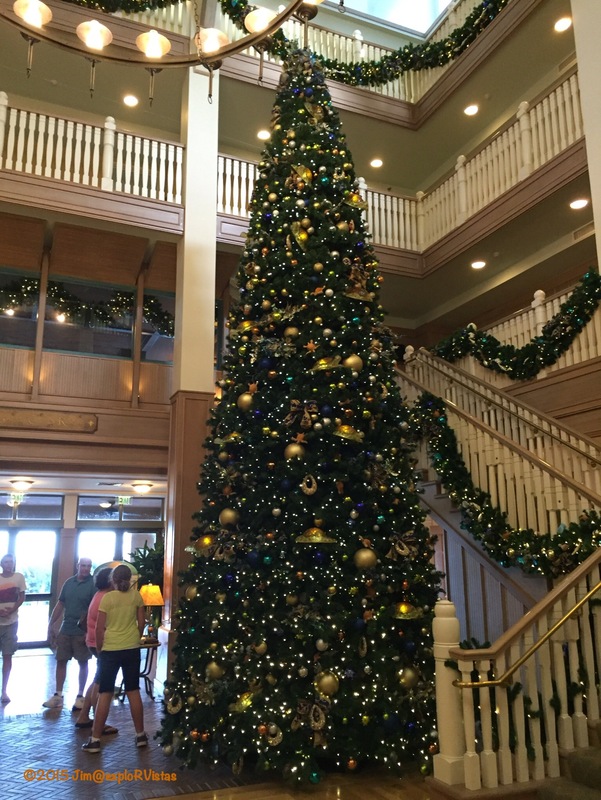 The Christmas tree in the soaring lobby was beautiful. 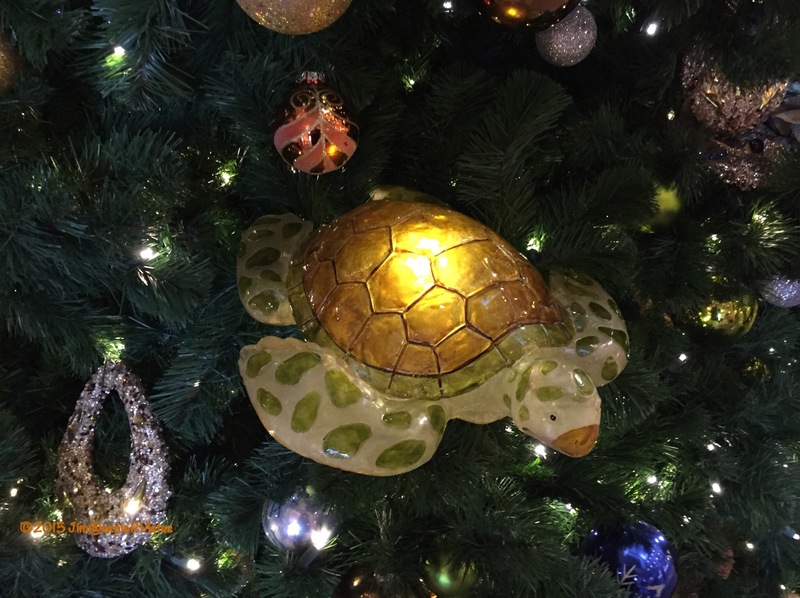 Upon closer inspection, the tree sported a sea turtle theme, as turtles are king along this coast. 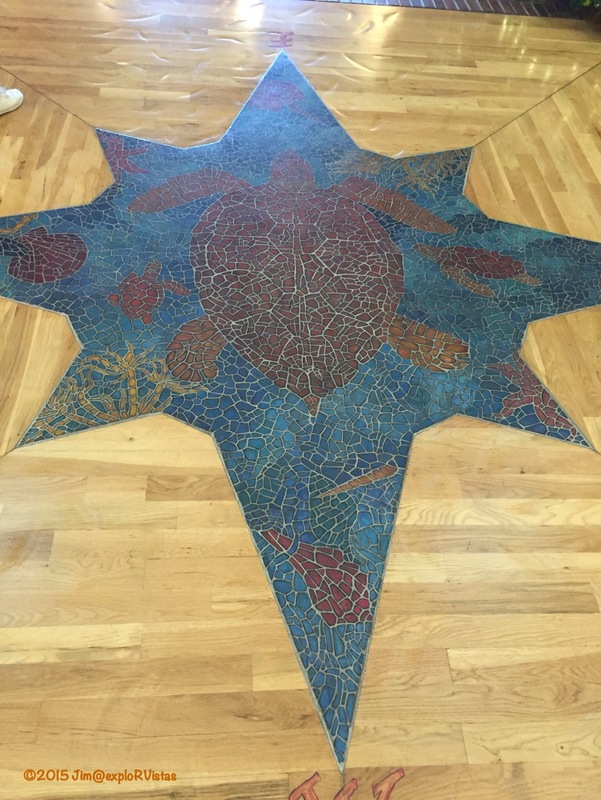 The compass rose in the center of the lobby has an inlaid turtle in it, and the surrounding wooden floor has divots carved in it that mimic the tracks that the giant reptiles leave on the beach when they come onshore to lay their eggs. Mary and Rod had loaned us a DVD called Turtle: The Incredible Journey, which really explains about these magnificent creatures. We are looking forward to learning more about them during our time here. Today we went north on A1A. The road heads up to Cape Canaveral and the Kennedy Space Center. That will be another adventure in the near future, but today’s destination was Cocoa Beach. No, we weren’t looking for a genie in a bottle, but Diana did spot a reference to the 60’s sitcom ‘I Dream of Jeannie’ along the side of the road. 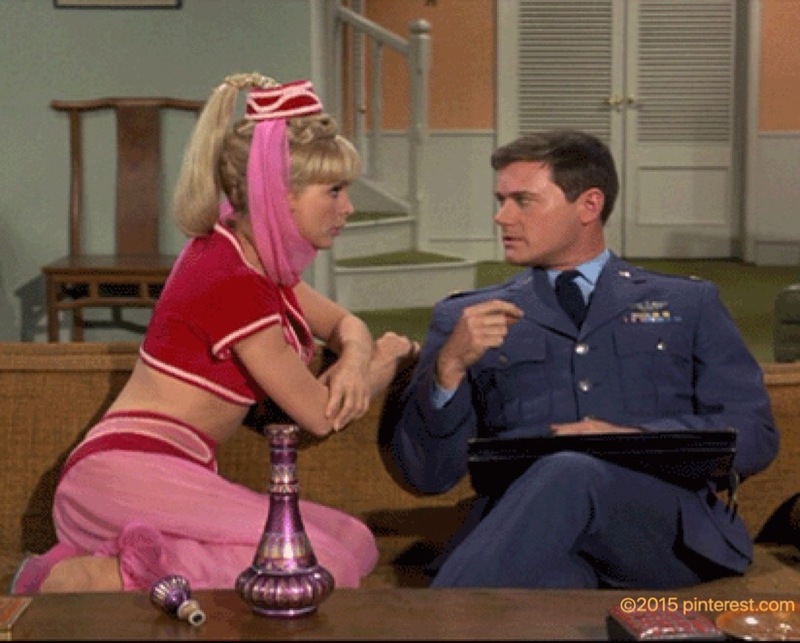 The show was supposedly set in Cocoa Beach, as one of the show’s principal characters, Major Nelson, was a NASA astronaut. Our destination was the iconic Ron Jon Surf Shop. Sounds like you two are having a ball. Good for you! It’s a good time for the stress of the last long spell to melt away. 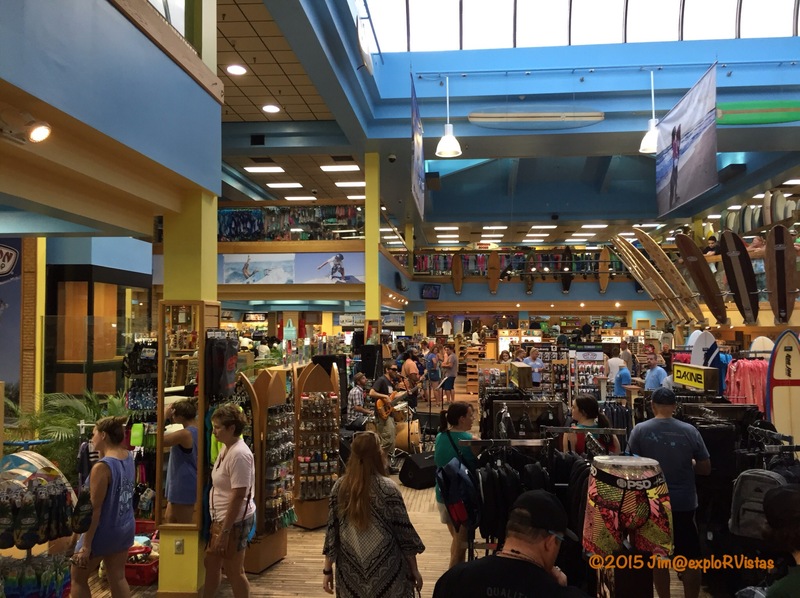 We visited Ron Jon…. oh golly, I can’t even begin to wonder when it might have been — 20+ years ago? Was also the first and last time I ever let myself get wrangled into a time-share presentation… funny, that. Not as much to keep us busy here at Perry — looking forward to finishing up our last 120 miles and settling in for a while. But here we are away from the airports and the interstate. so it’ll be a quiet 4 nights. 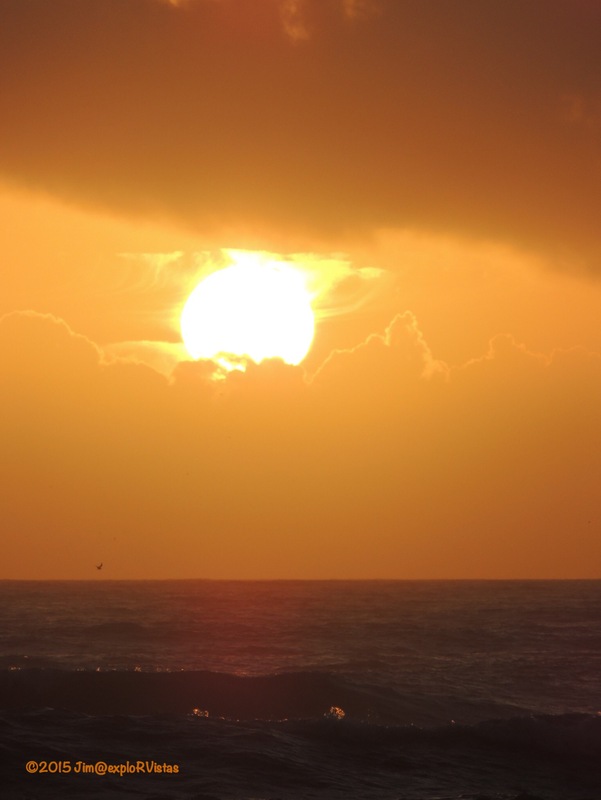 Great picture of the sun and surf! We have never been to Ron Jon, it looks like an experience. Thanks, Jim! Definitely a fun place to check out! Great to read the update. I explore vicariously through you two! Maybe we can come visit! 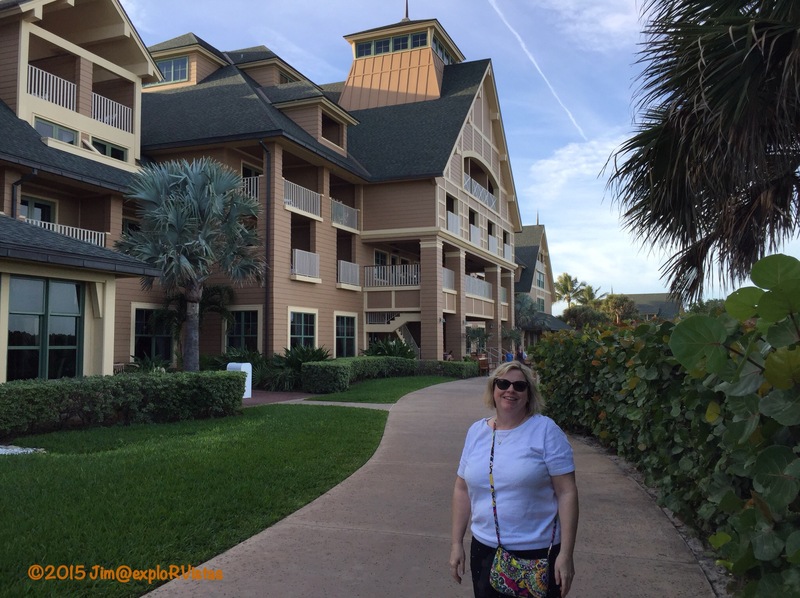 Could we stay at the Disney Resort? Bikes are a necessity in Florida. Starting in January the traffic is a mess near any beach. But a bike will get you almost everywhere. We rarely use our car when we are in Cortez on the west coast side. We ride our bikes and carry our larger backpacks to do all our grocery shopping. It is so much easier than doing the traffic thing with a car and much better exercise. We always laugh going up over a causeway. We call them Florida hills:) I figure at least 20 miles is necessary to get any kind of a workout since it is so flat. Sounds like you are having a great time getting to know the area. Will you stay where you are for the winter? Your sunrise walk was gorgeous:) Thanks for sharing it with us! Yes, we are planning on staying here through most of March. No doubt on the causeway…great hill substitute! Thanks for sharing! Walks on the beach are my favorite. Hope to head down to W. Palm at the end of January. West Palm is such a nice place, Phyllis! Good friends are a definite blessing when we’re faced with unhappy times. Your morning walks are wonderful – how nice to have them available for your long stay. Love the turtles!! Have a very Happy New Year. Can’t wait to find out more about the turtles, Jodee. We really enjoyed that DVD. It is unbelievable how far they travel! What beautiful beach photos. 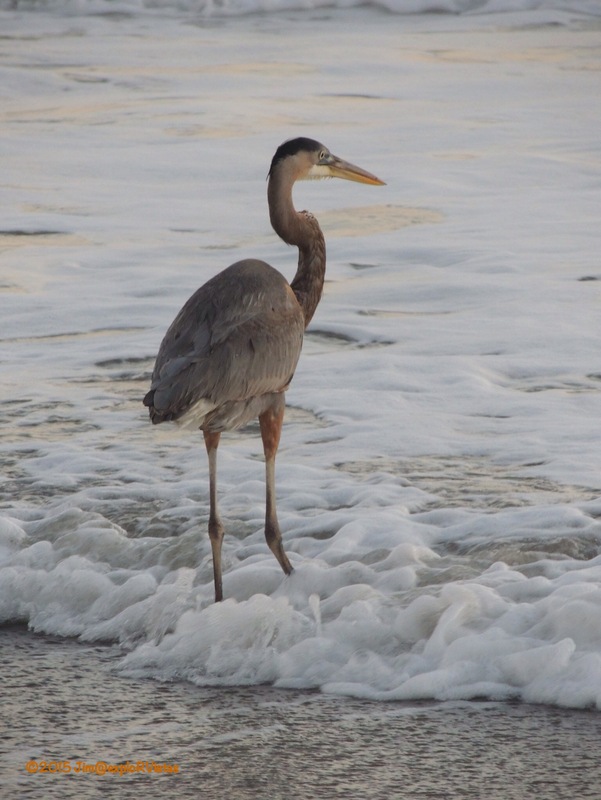 There is something so majestic about a Heron and I love the print in the sand. Happy New Year. Thanks, Shannon! Happy New Year to you also! Haven’t been to Ron Jon in many, many years! It is a must see when you are in the area. We bought several t-shirts and they are all worn out now. Happy New Year!